Those of you that follow me on Twitter (@JLAspey) will know how much I’ve banged on about the ‘Central Winger’ these past couple of months. It’s something I originally said whilst watching Angel Di Maria’s early performances in central midfield for Real Madrid, saying that he was playing almost like a central winger. It’s also a position FM Analysis has been analysing, particularly with Peter Pawlett of Aberdeen, a natural winger who has been moved inside into a midfield 3, much like Di Maria. Although the term itself may sound like football hipster mumbo-jumbo, it actually has a lot of reasoning behind it. In its basic nature, it’s the idea of playing a competent dribbler in central midfield, who can beat players and get to the byline to cross. Anyone who has seen Madrid this season can see the effect that Di Maria’s vertical and direct running has had on the whole team, and therefore it has made them extremely dangerous on the counter attack, something that has carried on from Mourinho’s Real side. In theory, the role can be so much more dangerous than just a normal winger, or a box to box midfielder. Defenders are unable to use the sideline as an extra defender (as they would against a normal winger), and instead are forced to engage a fast midfielder dribbling at pace, something no centre back would be comfortable defending against. In addition, the player also has a much wider range of passing options, especially if he has additional players breaking forward with him, especially in wide areas, and runners from full back. A setup utilising a CW has the potential to completely overrun the opposition defence. For a while now I’ve wanted to utilise the role on FM, but I’ve never really felt I had the correct players to allow the role to reach its full potential. I did use it in a save at Racing Club in Argentina, and whilst initial results were promising (for the role at least), the save was soon binned (my last attempt at a back 3). However, I’ve now started a new save in Austria with Red Bull Salzburg in 2018, and I believe I’ve got the CW working extremely well, and it’s become a key part of my tactical planning. The players I’m using aren’t even my ideal players for the role, but it’s still working extremely well. The players I’m currently using in the CW role are Mario Lemina and Kim Nielsen. Both are undoubtedly talented players, but if you could combine the two, you’d have the perfect CW for RB’s level. I’m still not overly sure who I prefer in the role if I’m honest, and most of the time I rotate the two for fitness anyway. Nielsen does have the better goalscoring record in the role though (you’ll see in this game). 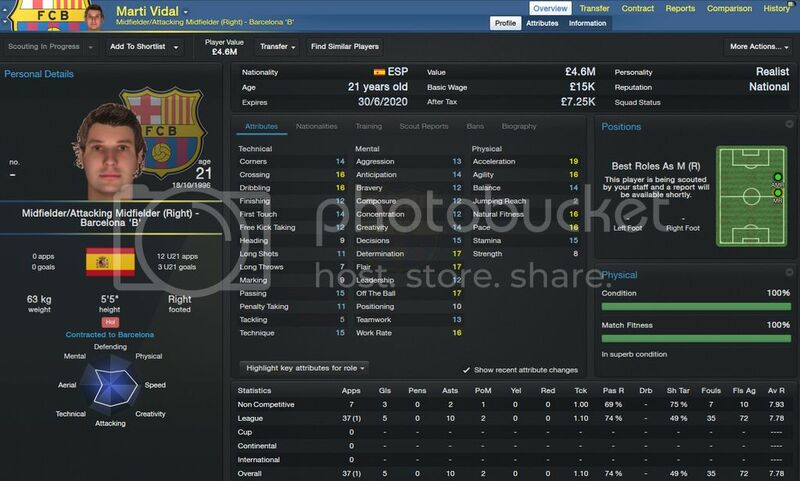 The player I’m keeping an eye on for the role is Marti Vidal of Barcelona, who has been moved up to their senior squad since that screenshot, but still isn’t in the first team. He’s been open to a move to Salzburg, just Barca won’t sell him. He’s got all the technical ability and physical pace needed to play the role perfectly. Anyway, the CW is surrounded by the setup you can see on the right, with a DLF to create space and drag defenders out of position, and two IF’s to exploit that space along with the CW. Combine that with a mobile roaming playmaker in Miladinov to control the midfield, and in theory there’s a setup to unlock defences. The match I’ll be using to illustrate the CW is a Europa League match against the Hungarian side Videoton. We’re already 4-0 up from the first leg at home, so I chose to rotate the team a bit and give my top players a rest for the upcoming league matches. I chose to play Nielsen in the CW role for this match, as Lemina had played our recent 1st vs 2nd match against Austria Wien, and therefore needed a rest. Here is how I set up the CW, starting as a CM-A with ‘press more’, ‘get further forward’, ‘dribble more’ and ‘run wide with ball’ selected. 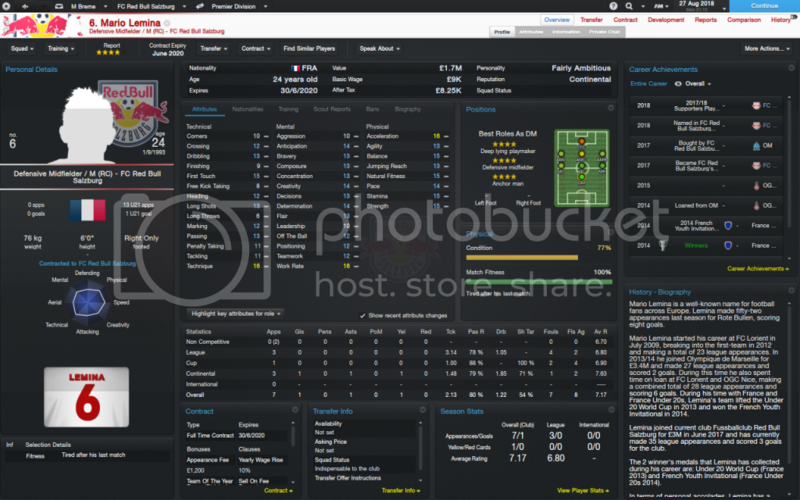 Ideally I’d also select cross from byline, but according to FM14, that’s a ridiculous thing to ask a midfielder to do. As the save progresses, that’s something I’ll have to ask my players to do through PPM’s. It’s why I’ve selected run wide with ball, in order to try and force him to get to the byline when he’s got the ball. Here you can see exactly the movement I want to see from the role. The DLF has dropped deep, leaving a large area of space between the LCB and the RB, with the RCB deciding not to allow the DLF too much space, and stepping out to challenge my striker. However, Nielsen is now on the move and is moving towards that space as Damari (DLF) plays the ball into him. In one very simple move we’ve confused the AI and created space we can now exploit. As you can see, Nielsen has continued driving forward, running at the defence (if the CW was a faster player such as Vidal, the midfielder wouldn’t catch up with him). This is where attacking layering comes into play, as my AML Pederson stays outside of the RB, who is now unsure whether to close down Nielsen, or stay with Pederson. He dithers long enough for Nielsen to be able to slip the ball through for Pederson, and we’ve overloaded them down our left hand side. This is all entirely due to the movement and combination of the DLF and the CW. Not only does Nielsen play the ball through for Pedersen, but he then drives towards the box, and we’ve now got 3 v 2 in the box as Pedersen puts the cross in. My DLF Damari (who started the whole move) gets his head on it and puts it in the corner for our first of the game. This is exactly the kind of vertical attacking football I love, and the kind I want my Salzburg side to play. This isn’t a goal assisted or scored by the CW at all, but you can see how his vertical movement has opened up the defence, and allowed us to go 1-0 up. Again you can see the havoc that is caused by the DLF, and how important he is to the success of the CW. He’s dropped off again, and this time the CB decides to stay home, leaving Damari with plenty of space to turn and pick out a pass. What’s worth noting is that Nielsen (circled in blue) has actually moved forward and occupied the space left upfront by Damari, only dropping off slightly once Damari has picked up the ball. Damari picks the pass out to the AMR and once again we’re now looking at overloading them down the wings. The CW is now in a position to stay forward and influence the attack and get into the box. We’ve now achieved the overload as our CWB right back has marched forward, and collects the quick ball inside from the AMR. Our CW Nielsen has already been driving to the near post, and is in the perfect position to then finish off the move. Once again, the movement caused by the DLF and the CW has undone Videoton. The CW will also take up very advanced midfield positions at times when we’re in position, almost in an AMC position. Here and Here are examples of his ‘get further forward’ instructions allowing him to move into those positions at times. It’s not something that I particularly want from the role, but fluidity isn’t something I’m going to stop, and picking up those positions will help link the rest of the midfield to the attack. The CW’s advanced positioning can also be clearly seen in the average positions map. When you compare Nielsen’s positioning compared to his other midfield partners, he’s clearly the attacking part of the trio. That shape of midfield is something I’ve seen in other games, but usually the AP-S is a bit more advanced than in this game. The Central Winger also contributes to the passing game as you can see in the passing map, and isn’t just a one dimensional role that constantly runs at defences. He made the 2nd most passes in the whole team throughout the match, only beaten by the roaming midfield playmaker, who always ends up with the most passes. He had a fantastic game, and out of our 4 goals, he was directly involved in 2 of them. The Central Winger is certainly a role that I still need to develop somewhat, through PPM’s in particular. If I can teach a player to keep crossing from the byline, it could take the role to another level. In addition, if I can develop/buy a player with similar attributes to Marti Vidal (or Vidal himself), the CW will become even more dangerous for opposition defences. 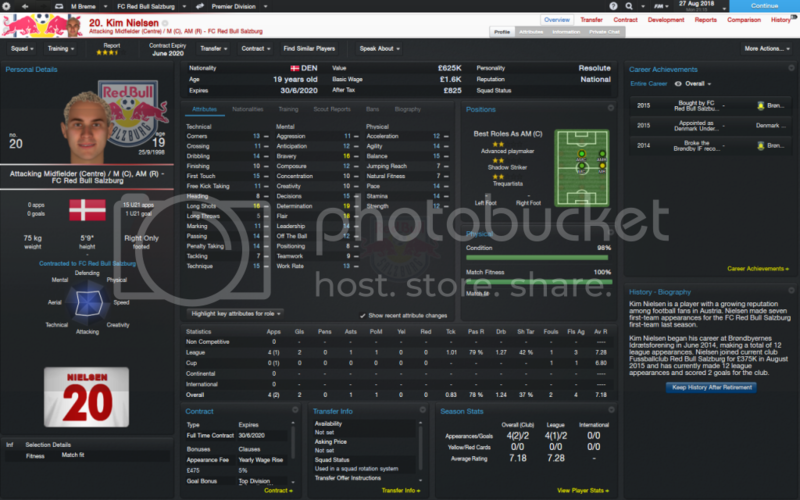 It’s arguably become the key part of my Salzburg side though, and it’s clear it has definite potential. – To end, I’d like to say thank you to Guido for allowing me to put this article on his blog. If anyone reading this has any questions, don’t hesitate to contact me. You’re welcome, matey. As I said before, a brilliant piece and one deserving far, far more attention!